Participants of the rally have demanded to prevent restriction of the freedom of speech on the Internet and also declared inadmissibility of reprisals against those people who simply express their opinion. 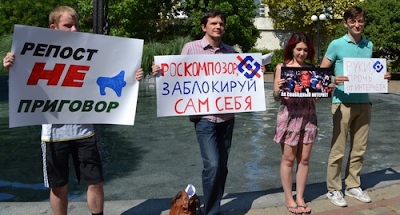 In Sochi, a picket against censorship on the Internet was held in Komsomolsky Square and ended without incidents, the "Caucasian Knot" correspondent reports. In their hands, the picketers were holding posters reading: "Hands off the Internet" and "For free Internet!" One of the picketers was holding in her hands a poster reading: "Prison for likes and exile for a repost?" The young woman has explained she has come to the picket, since she is aware of many cases when people are brought to responsibility only for the fact that someone posted on their pages in social networks a video which the authorities treated as illegal. "An owner of a page in social networks can be brought to responsibility even for liking a video," the picketer has expressed her indignation. Victor Vasiliev, who took part in the protest action, said he came to the picket "because of his desire to live in a country with the laws and without authorities’ corruption."